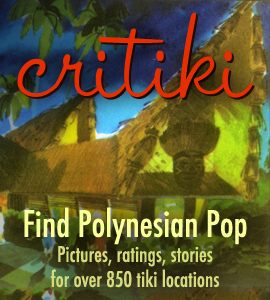 Critiki is a travel guide and historic archive of Polynesian Pop culture hotspots around the world, with information on over 1,000 tiki bars, restaurants, hotels and more. Critiki has over 9,000 members, tiki lovers who have shared their stories, mementos, pictures, and over 100,000 ratings of the places in Critiki, in an effort to guide their fellow tiki seekers to the good stuff. In last year’s Ten Best list, I said “Any list of the best tiki places that isn’t topped by the Mai-Kai is to be ignored.” [Awkward cough…] I haven’t been to TikiCat yet, but here’s the deal: LOTS of you have made the pilgrimage, and have reported a top-tier, expectations-beating experience. And I’m not talking about reports from over-enthusiastic tiki novices here, I’m talking about world traveling, jaded tikiphiles who have discerning tastes and know the standard set by the Mai-Kai. The man behind TikiCat, Mark Sellers, has been a tikiphile for a long time, and has many years of hospitality experience. He clearly has what it takes to execute a great tiki bar, and I’m looking forward to seeing what he does next. Sixty years strong, nothing delivers like the Mai-Kai. It may have been beat out his year by TikiCat, but that doesn’t change that what the Mai-Kai offers isn’t offered anywhere else: a living history example of the pinnacle of mid-century Polynesian restaurant grandeur. Polynesian dancers and musicians, multiple themed dining rooms, landscaped gardens, the full fine dining experience… it’s truly without compare and stands on its own. Nothing could ever truly beat the Mai-Kai. Last year, False Idol was too new, with not enough people having weighed in. Now that we have more reports, it will surprise no one that Martin and Rebecca Cate’s latest over-the-top tiki venture is a hit. Operated in partnership with the Consortium Holdings group, False Idol delivers on expertly crafted tiki cocktails, in an alternate-universe environment created with Tiki Bosko. Thanks to the Cates’ natural hospitality instincts, they even managed this year to achieve what seemed impossible: gracefully handle Tiki Oasis, a convention of thousands of thirsty tikiphiles who all had visions of a night at False Idol. Recent years have seen a management change at Hale Pele, with Martin Cate taking a more forward role, but the continuity of a wonderful and committed long-term crew at Hale Pele means that hardly anyone noticed. But here’s a fun change you can see: the front windows have been covered up, upping the transporting factor. If you haven’t been in a while, make a return visit to check it out. Heck, even if you have been recently, I don’t need to tell you, but you should go again. For years, Foundation has been a sleeper hit. Owner Don Nelson brought his bar into its current tiki-encrusted state over time, with a big assist from local carver Dave Hansen. It took a while for the rest of the country to catch up with what Milwaukee already knew: Foundation is world class tiki. But word has been out for a while now, and more folks are going out of their way to visit Foundation. If you’re considering a trip, they’ve made it even easier, with a tiki-themed AirBnb directly above the bar. Like False Idol, UnderTow was too new to make the list last year, and has quickly emerged as a must-visit destination. And they’re not resting: UnderTow has already had interior designer Tiki Diablo come back to add more decor. While the ship’s hull space is a huge draw, it’s the drinks that really have people coming back again and again. If you’re planning a visit, be sure to make reservations, as the space is small. You may be surprised to see the world famous Smuggler’s Cove this far down on the list of great tiki bars, but it just goes to show how crowded it’s getting at the top. Martin and Rebecca Cate’s little rum-focused tiki bar completely reset the world’s expectations of what a tiki bar could accomplish. Nearly eight years on, it remains a touchstone of not just tiki bars but of all bars. The Trader Vic’s chain of Polynesian restaurants is not just still around after 80 years, with locations in twelve countries, it has been reconnecting with its Polynesian Pop roots. Their new mug offerings are beautifully executed and widely coveted, and my own local location, in Emeryville, has been holding events that directly cater to the local tiki lovers. But among those who have seen most or even all of the Trader Vic’s locations, it’s the location in Munich that is held up as the most beautiful, and the best-preserved example of what Trader Vic’s was like in its mid-century heyday. Smuggler’s Cove may have helped tiki reach a wider audience, but it was Forbidden Island in sleepy Alameda that truly set a new standard for tiki bars when it opened in 2006. It was here, under the view of partners Martin Cate, Michael Thanos and Mano Thanos, that it was demonstrated that the key to success in a modern tiki bar was to not pull any punches, to deliver on-theme excellence in every aspect, from the drinks to the decor to the hospitality. Martin left the partnership just before opening Smuggler’s Cove in 2009, but the experience lives on and remains a favorite tiki destination. Ahhh, Tiki-Ti. Tiki-Ti defies description. I’ve written plenty of words about it over the years, I’ve tried to explain it in a thousand conversations, but nothing could possibly communicate the bizarre magic of a night at Tiki-Ti. The Buhen family runs the friendliest bar in the world, and life-affirming encounters happen there every night. Its appearance can surprise hard-core tikiphiles: it looks more like a well-worn funky bar in someone’s garage than a palace of Polynesian idealization. My life is peppered with incredible memories made at Tiki-Ti. Go make some of your own. “What??? Why isn’t [insert your personal favorite tiki bar] on this list?? ?” Go look up your favorite location on Critiki, and take a look at its score, look at its rating details where it’s broken out by category. A score in the 8-point-whatever range is still an outstanding, must-see place. There could be a list that’s 30, 50 locations long of all the places in Critiki that are must-sees. Here are the places with impressive scores above 9.0 that didn’t quite make the top ten: Beachbum Berry’s Latitude 29, New Orleans, Louisiana; Frankie’s Tiki Room, Las Vegas, Nevada; Pagan Idol, San Francisco, California; Lei Low, Houston, Texas; Trader Sam’s Enchanted Tiki Bar, Anaheim, California; Trader Vic’s, Atlanta, Georgia; Trader Sam’s Grog Grotto, Orlando, Florida. A testament to all the great work being done at the new generation of Tiki bars. Also, quite an achievement for Martin Cate, who had a hand in no less than five of the cocktail menus on this list. Congrats to all!